Halloween is just around the corner! Do you have your costume picked out yet? So far we have three costumes for my son (I know…a little overboard) so we’re trying to decide which one he’ll wear for trick-or-treating. Since he’s only two, we only trick-or-treat to about 3 houses plus the mall. Have your kids starting counting down the days until Halloween? 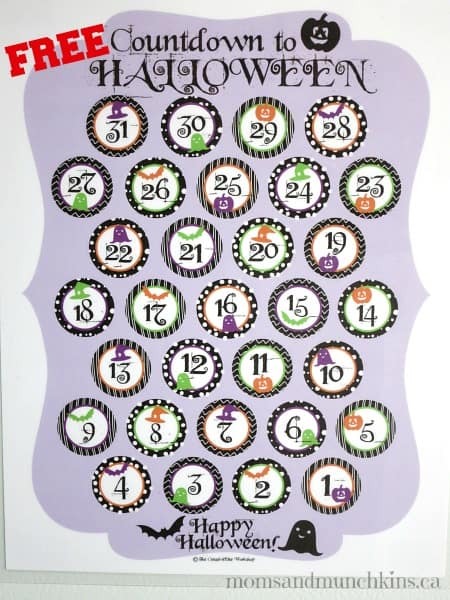 We have two free Halloween Countdown Calendar ideas to share with you today. You could try one or both! The first is a single page that is perfect for laminating or putting in a frame for display. Each morning the kids can use a dry erase marker to mark off one less day until Halloween. We put magnet stickers on the back of ours and placed it on the fridge. The second idea is a hanging sign that says “Happy Halloween” along with 31 circles to countdown the days until Halloween. I placed a small magnet sticker on the front side of the Happy Halloween sign and then magnet stickers on the back of each of the day circles. Each morning the kids can simply swap one tag for the next day (31, 30, 29…until they get to Halloween). 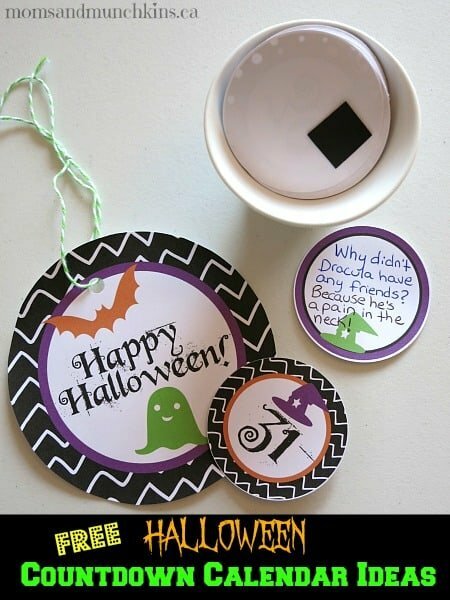 What I love the most about this idea are the extra blank circles to write Halloween jokes or special messages on. You can mix these in with the countdown days so some mornings your kids will get a little joke too! I punched a hole in the top of the Happy Halloween sign and used baker’s twine to hang it from our key hook by the front door. I’m storing our numbers upside down in a little glass container designed for hard boiled eggs. It is the perfect fit! A big THANK YOU to Denise of The CreativiDee Workshop for creating these fabulous printables for us! These free printables are available to Moms & Munchkins Monthly Newsletter Subscribers. The newsletter is free and you can sign up here. Each month we’ll update you on what’s planned for Moms & Munchkins along with a fun free printable to enjoy with your family. After you sign up, you’ll be sent the secret password and link to the free printables page (including all of the past free newsletter printables of 2013). The free Halloween Countdown Calendars have just been added! For more Halloween fun, visit our Holidays Page and scroll down to October for the Halloween section. We’re always adding new ideas so follow along on Facebook, Twitter, Pinterest and Bloglovin’. Very, very cute! Your printables are so professional! Thanks so much for sharing at After School. Thanks for sharing in the After School Linky Party! Ours are printed and ready to go! You’ve been featured this week in a Roundup of Halloween Activities! You make it to hard to find the download. Would have loved to print this. Can’t even find a place to put the code in.